Each year the ACSEP receive a small number of applications (3-4) from Specialist International Medical Graduates (SIMGs) for specialist assessment. Between the years of 2014-2018, ACSEP received 12 applications, with 11 of the 12 applicants were found to be partially comparable following their paper based assessment. The 12th candidate was found to be not comparable. Following assessment, those deemed partially comparable were required to complete between 12-24 months’ worth of supervised training under an ACSEP Fellow. In the last 5 years, only one applicant has successfully obtained Fellowship. The table below shows the results of applicants assessed by the ACSEP by country of origin. It is important to note that there is no region of the world where an applicant has been assessed as substantially comparable. Please note that each application is assessed on its individual merits. 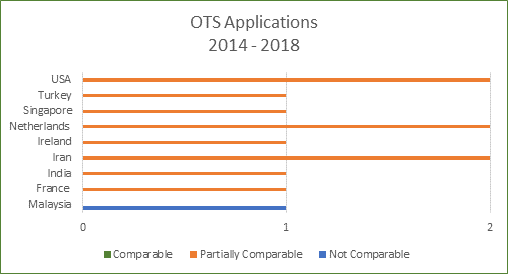 OTS applicants who have been assessed as partially and substantially comparable are required to complete a level of SEM supervision prior to a final assessment being undertaken by the OTS Committee. It is the responsibility of the applicant to find a suitable supervisor who is willing to undertake the supervision for that period of time. Please note that SEM training and supervision is undertaken within a private practice environment with no external funding available. Due to this, it may be difficult for an applicant to secure a supervisor as the requirements of sponsoring an overseas trained doctor can be significant. For further information regarding working in Australia, please contact the Department of Home Affairs.